Scientists at the South Australian museum (Adelaide, Australia) are hoping the discovery of the fossilised remains of a giant marsupial might be able to provide them with further insights as to what led to the demise of Australia’s megafauna, animals as diverse as hippo-sized Wombats, predatory Thylacines, giant Koala bears and Monitor Lizards twice as big as Komodo Dragons. The giant marsupial in question is a Diprotodon, a strange and diverse group of mammals unique to Australia. Diprotodontids are an extinct family of marsupials, the majority of which were plant-eaters and some evolved into giant forms becoming the largest mammalian herbivores the continent has ever seen. The first Diprotodontid fossils are known from Eocene deposits and they may have persisted until around 45,000 years ago. Palaeontologists have puzzled over why the Australian megafauna died out. 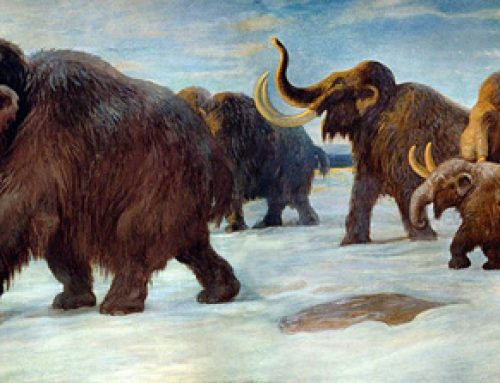 It has been proposed that hunting and the burning of forests by the first human settlers on the continent hastened the demise of these large animals, however, rapid climate change may also have played a prominent role. Field Workers Excavate the Giant Marsupial Fossil. The fossils of the three metre long Diprotodon were found at the remote Collinsville Merino Stud, a substantial sheep and cropping station approximately eighty miles north of Adelaide. The fossils were discovered in mid 2010 when Paul Cousins, a sheep station worker, came across the fossils eroding out of a riverbank whilst on a camping trip with his family. He took some of the exposed fossilised bones to a local museum knowing that they represented the remains of a prehistoric animal but he was unsure whether or not they had discovered a dinosaur. Museum staff identified the specimens as Diprotodontid fossils and a team from the South Australian museum was dispatched to excavate the rest of the fossil material still embedded in the ground. Associate Professor Rod Wells of the South Australia museum commented that over 500 man hours had already been spent excavating and preparing this specimen and he asked for more field volunteers to help with the excavation. The fossils have been dated to around 120,000 years ago, a time when people had yet to reach Australia, according to most palaeoanthropologists. The fossil matrix, the sediment in which the material was found, may provide clues to the extinction of Australia’s unique megafauna. The sediment in which the bones of this large, plant-eater were deposited are very finely grained. The fossils were discovered by the Cousins family in a creek bed that was eroded by seasonal flooding and exposed. The strata in the immediate vicinity of the fossil material, as it is so fine suggests a hot, dry and windy environment. The Australian scientists have speculated that this large animal may have died in a prolonged drought or fallen into a dried up river channel, the carcase would have been washed down to its final resting place in later, seasonal flooding. This suggests that the climate may have been more extreme 120,000 years ago with very dry periods followed by intense, seasonal rains which may have caused extensive flooding. The location of this fossil material adds to the debate as to whether climate change played a significant role in the extinction of a lot of Australia’s unique, native fauna. Harsh environments and rapidly changing climatic conditions would have affected large animals at the top of the food chain to a greater degree than smaller animals. The larger species of Diprotodontids may have been struggling to survive and then with the advent of the first human settlers, they were finally driven to extinction. Rod Wells has suggested that the more fossil sites such as the Collinsville location that the scientists explore so they will be able to build up a more complete picture regarding the climate of Australia during the Pleistocene Epoch. Such data will help them to understand why these huge animals perished along with the other amazing megafauna that once roamed the outback.